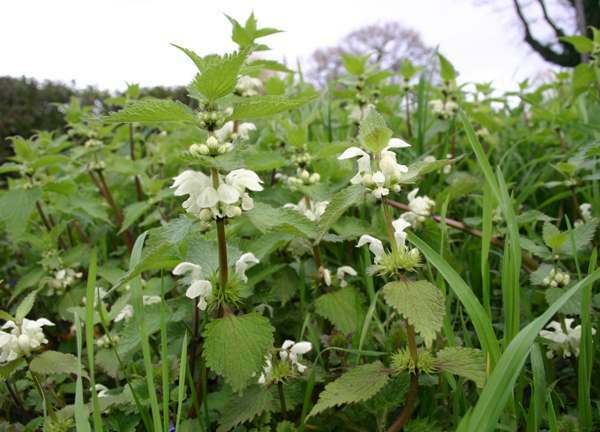 Before the distinctive flowers appear it is easy to mistake White Dead-nettle and Stinging Nettles; the other way round can be a painful experience! This creeping perennial of the Mint (or Dead-nettle) family is much more nettle-like in appearance than is its close relative Red Dead-nettle Lamium purpureum. Its heart-shaped toothed leaves are finely hairy, but unlike their dreaded doppelgangers these hairs are not of the stinging kind. Flowers of Lamium album are 1.8 to 2.5 cm long and mainly white with just a tinge of green on the lower lip. Once fully open, the lips of the flower are widely separated, like gaping jaws. 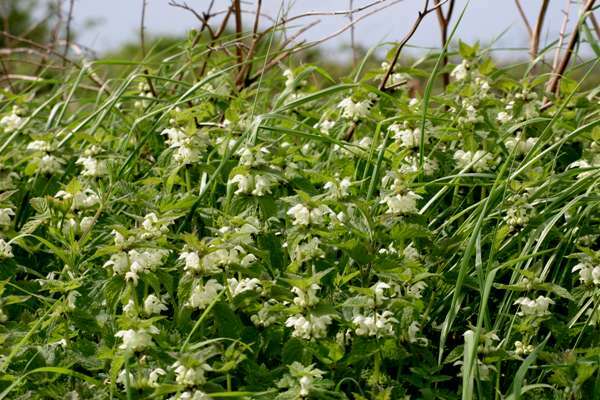 White Dead-nettle is widespread and common throughout Britain except in the far north of Scotland; it is found occasionally on the eastern side of Ireland but seems to be absent in the far south and west. This species is recorded across most of mainland Europe and in western Asia. Found mainly on roadsides and wasteland, this wayside wildflower is also quite a common sight in churchyards and on the grassy verges of paths beside canals and rivers. 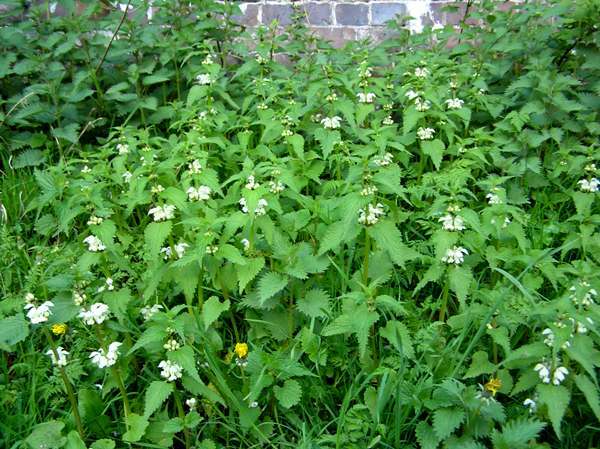 Once it colonises a piece of disturbed waste ground, White Dead-nettle soon spreads to form dense patches. 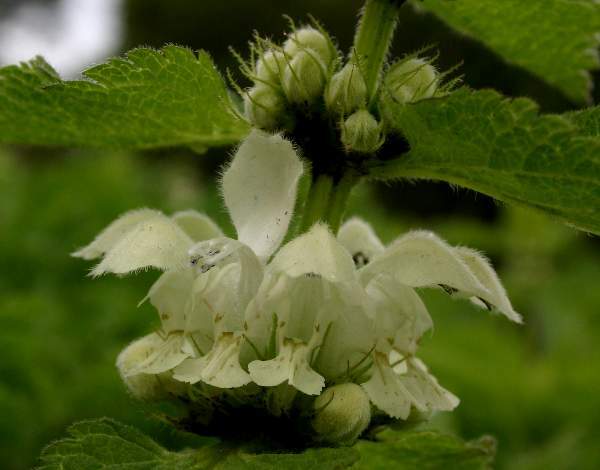 In Britain and Ireland White Dead-nettle Lamium album blooms from late March until November, and in very mild winters flowers can persist right through to the end of the year. Seen as a weed by most gardeners, White Deadnettle is nevertheless greatly valued by bees and other insects, because each of the flowers contains a tiny drop of nectar at its base. Lamium, the genus name, is the Latin word for Dead-nettle; however, plants of this family were once known as Labiatae, and labia means lips. The distinctive two-lipped flowers of the Lamiaceae are sometimes referred to as bi-labiate. As you would expect, the specific epithet album means white and refers to the colour of the flowers. Red Dead-nettle Lamium purpureum has reddish-purple flowers and purple-tinged leaves. Yellow Archangel Lamium galeobdolon has yellow flowers. The White Dead-nettle pictures shown on this page were taken in southern England and in West Wales during May.